Larissa has been exploring her passion for West African, Congolese and Afro-Cuban rhythms since 1995 with many teachers, including Mabiba Baegne, Ubaka Hill, Yona Fleming, Molonga Casquelord, Carolyn Brandy, Stori Davis, Barbara Borden, Catherine Veilleux, Amadou Camara, and Afia Walking Tree. Larissa has traveled to Guinea, West Africa several times to study dance with Youssouf Koumbassa, Yamousa Souma, and Bangali Bangoura and djembe and dunun with Amadou Camara, Lamine Dibo Camara, and Dartagnan Camara. She performs with Afia Walking Tree's Spirit Drumz ensemble as well as with Mamayah, a Sonoma County-based women's West African drum ensemble. She also performed with Motherbeat, a women's conga ensemble. In 2017 Larissa was part of the drum ensemble supporting Jennifer Berezan's Song For All Beings performance. Larissa teaches West African inspired drumming and dundun dance at women's events. 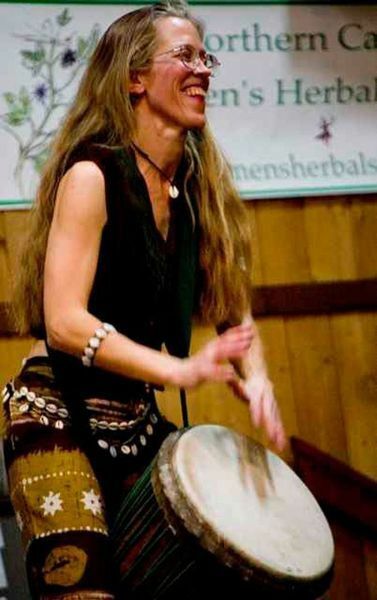 She has taught at Carolyn Brandy's Born to Drum camp, the Northern California Women's Herbal Symposium, Z Budapest's Goddess Festival, and Elderflower Womenspirit Festival. She assisted Ubaka Hill at Michfest where she helped teach and direct the Drumsong Orchestra. She has assisted and taught with Afia Walking Tree at the Ontario Womyn's Drum Camp and in many other venues. Larissa accompanies dance classes, women's rituals, and healing circles. In her own words Larissa shares: "Drumming allows me to express my joy, strength, and freedom, while serving the spirit of the music, the dance, and the empowerment of women.